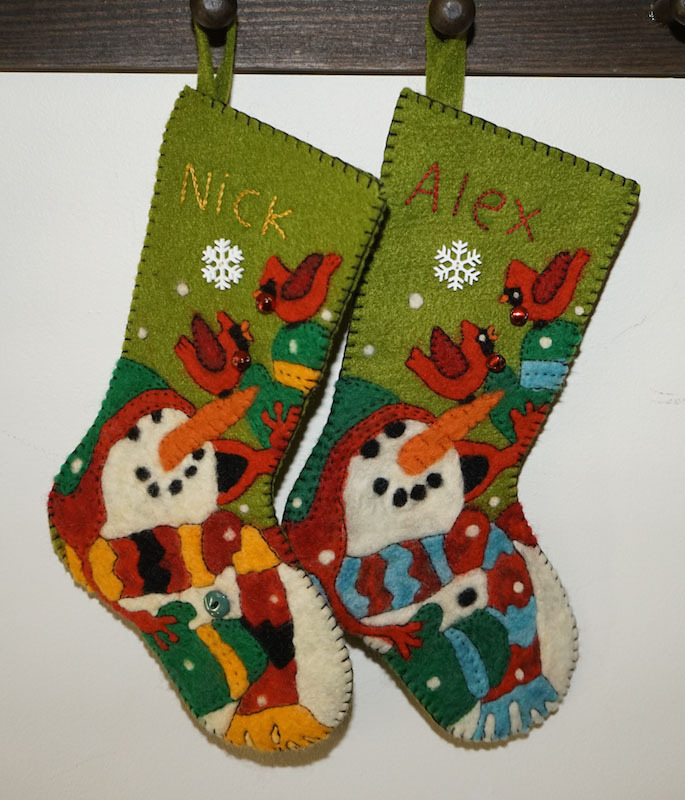 Christmas Stockings and Holiday Fun! 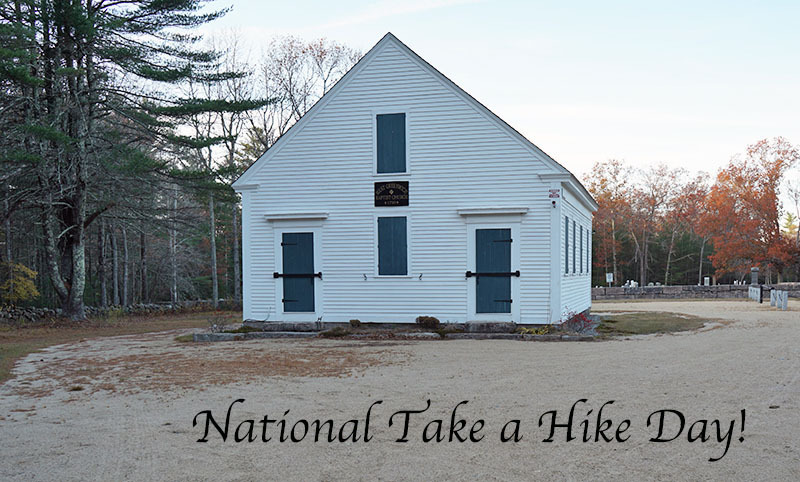 National Take a Hike Day! Well, another year has gone by and I never got half the things I wanted to make, done, lol. I really need to start now for next year, I still want to have large quilts to hang around the house and patterns I bought years ago and never got a chance to make, so I guess it is time. I also have pieces I made and didn't finish, so those will get done next. 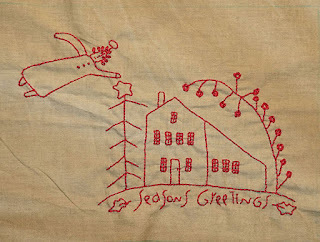 It is hard to keep up when there are so many wonderful freebies this year, I still have Buttermilk Basin's christmas quilt, Cheri's Blackbird Gathering quilt and now another blog hop hosted by Buttermilk Basin. I had to make Cheri's piece, love her designs and this was fun to do. I have an idea for it, so I will show you when I am done. I kept it in red work, but I really want to try one in black, with red and green too. One will be a gift, one for me. I also think this would be nice as a pillow, lots of possibilities. This weekend was mostly shopping, a few gifts and a few things for me. We went to a few primitive stores and consignments, but not a great selection or things that interest me. 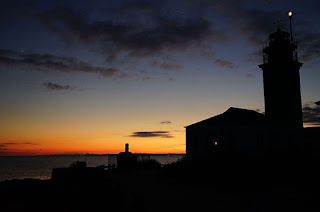 We did get home in time to run over to the lighthouse, before sunset. It wasn't too cold so we were able to walk around and take photos, but the sun wasn't as spectacular, mostly yellow and orange and it was gone. I wanted to look from the other side to see if I could get the lighthouse with some color behind it and I am glad I did. 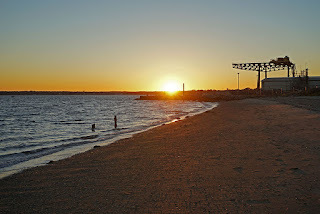 The best part of the sunset is when it gets darker and the sun is beaming across the ocean, the color was spectacular. 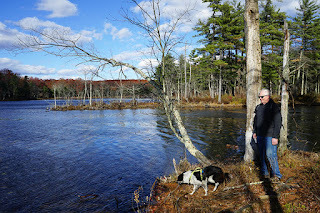 On Sunday we drove to Woodstock Ct. 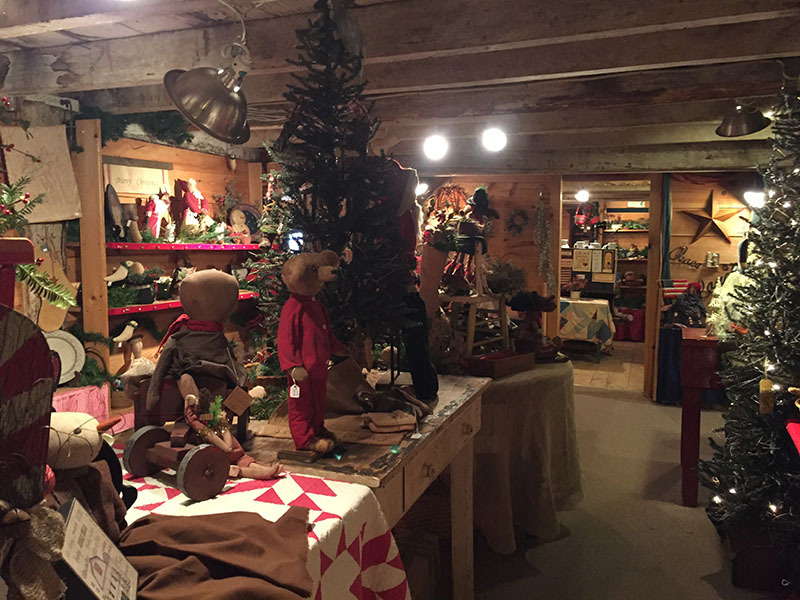 I wanted to visit a primitive store and we couldn't find it, but we did find a few antique and prim stores and a Christmas barn. It was fun browsing but I found the prices to be higher than other stores, but it was fun to look and there were also antiques mixed in. The owners are also very friendly and helpful. 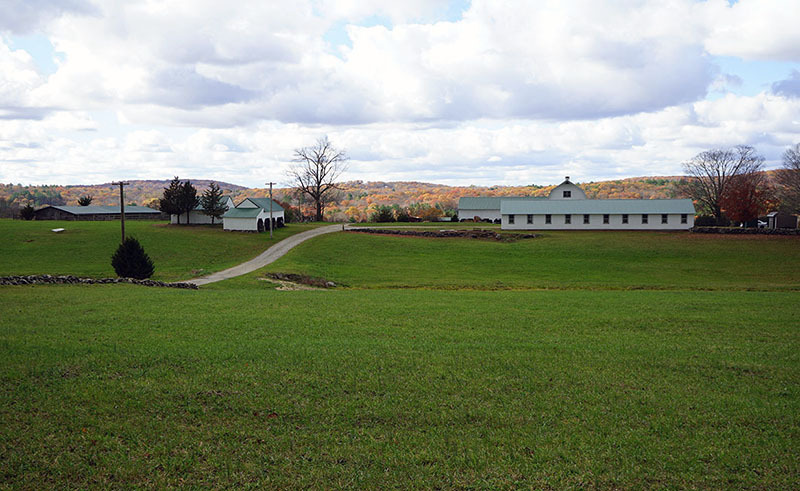 Woodstock is definitely a place to visit and I can imagine how beautiful it was, during full foliage. One thing I love about driving around is, I find new things. We were taking a short cut from one main road to another and my bad eyesight took us down the wrong one, but it still got us to the same destination. It took us across this bridge and I noticed some trucks below, so I had to check it out. It is a part of the Quinebaug River Trail, we found a new boat launch, can't wait to try it next year. 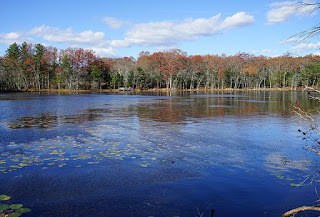 Looks like a beautiful stretch of the river, to paddle. I hope you all had a wonderful weekend. Now it is time for me to get the boxes out and get ready for Christmas. 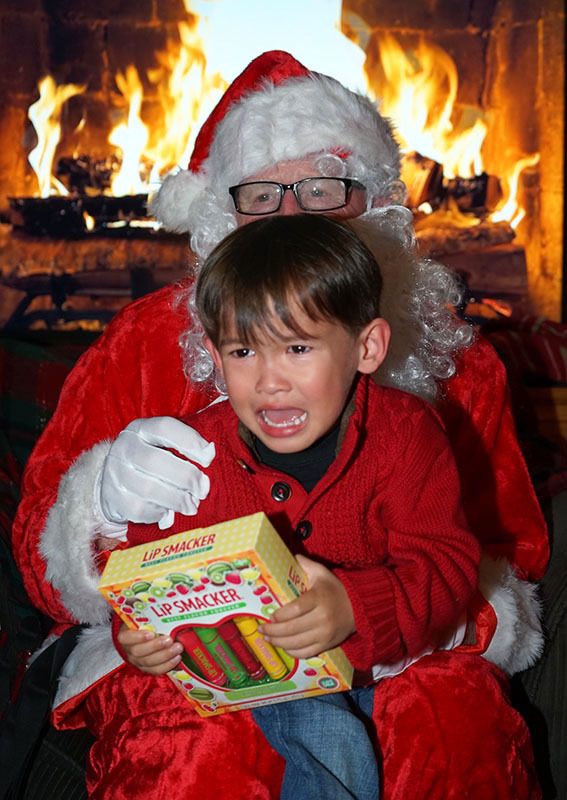 I hope everyone had a wonderful day yesterday, ours was wonderful and ended on a bad note when my son got mad at me for not letting him do things his way and left in a huff. When it comes to my computer, nobody messes with it;) But, I enjoyed the time with family and my sweet grandsons, so that is what I will remember. I also finished the stockings, not perfect but they were a pain with the felt, I prefer to felt into wool, much easier and it blends nicer. Plus the roving they give you in kits feels more like acrylic than wool, so not the best product, but still fun to do and an easy way for a beginner to try their hand at needle felting. I forgot the eyes on one, but fixed that before I gave them to the kids. I outlined the designs in black and added a few embellishments to make them more fun. 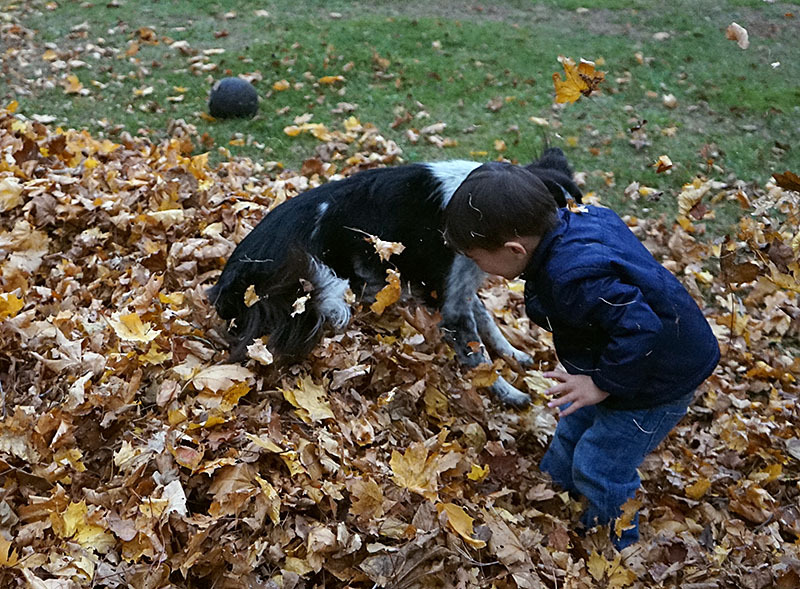 It is always fun to have the kids here and Bean loves playing with Nick. 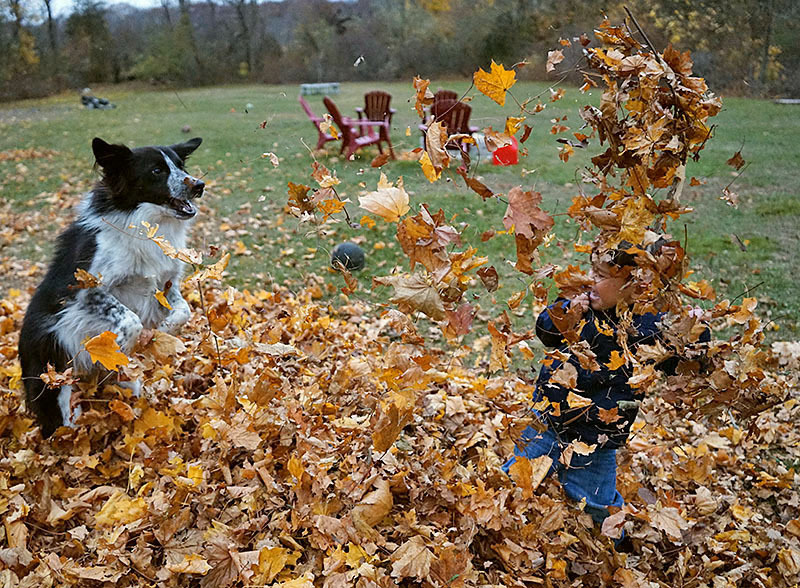 Bean found someone who loves leaves as much as he does. The secret lives of boys and dogs. Dinner was delicious except for my stuffing. I made my cornbread stuffing but decided to try adding pineapple, bad idea, it was too moist and tasted like desert, way too sweet and mushy. After dinner was photo time. 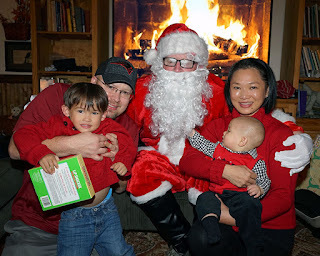 My son bought a santa suit and Grandpa got to wear it. Well, this is what happened when we tried to get Nick sitting with Santa. He had no idea it was grandpa and wanted no part of Santa, even a gift wouldn't get him to smile. 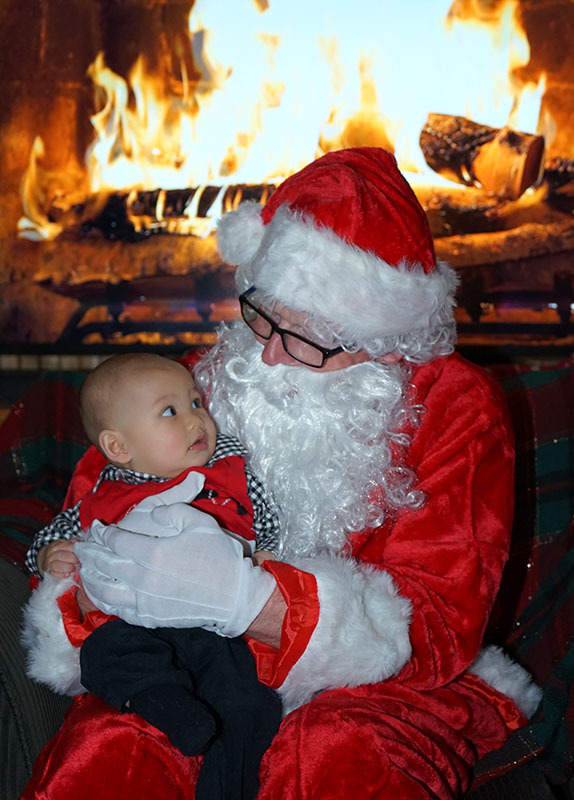 Alex was quite happy to sit in his lap and loved the beard, it became a struggle to get shots without losing the beard in the process. And then the family shot, of course we all know how those go. When you get a couple to smile, there is always one who is making a face or being goofy, or looking in the wrong direction. We were able to get a few fun ones in. 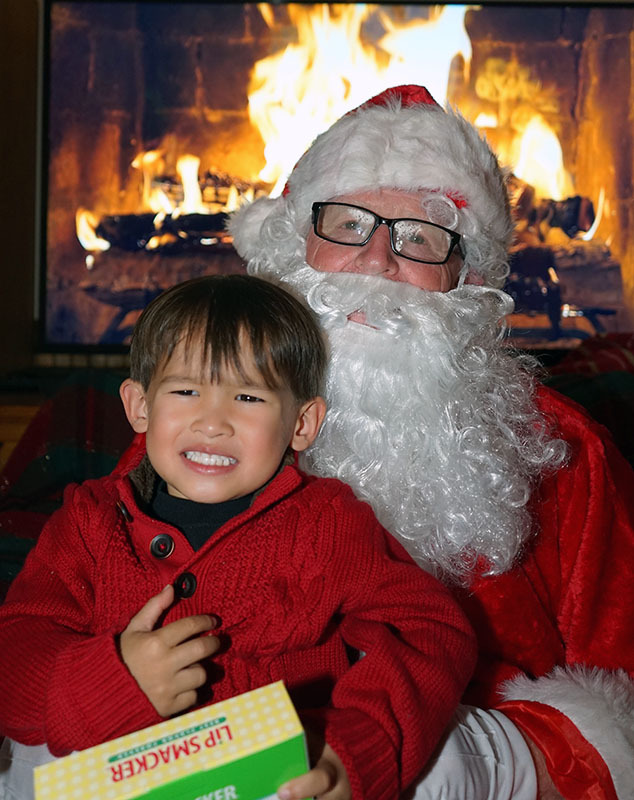 As you can see, the fireplace behind santa is actually the tv, works great with the close up of the kids, but shows with a larger photo. Have a wonderful weekend. We are spending ours, relaxing and long rides to out of the way stores with no crowds. 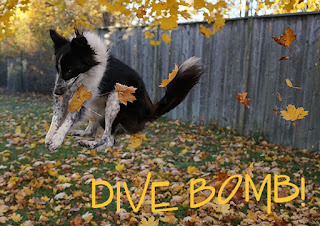 This weekend was a slow one, seems I have been overdoing it and my body let me know, so this week I am resting and trying to get a bit done, so we are ready for Thanksgiving. 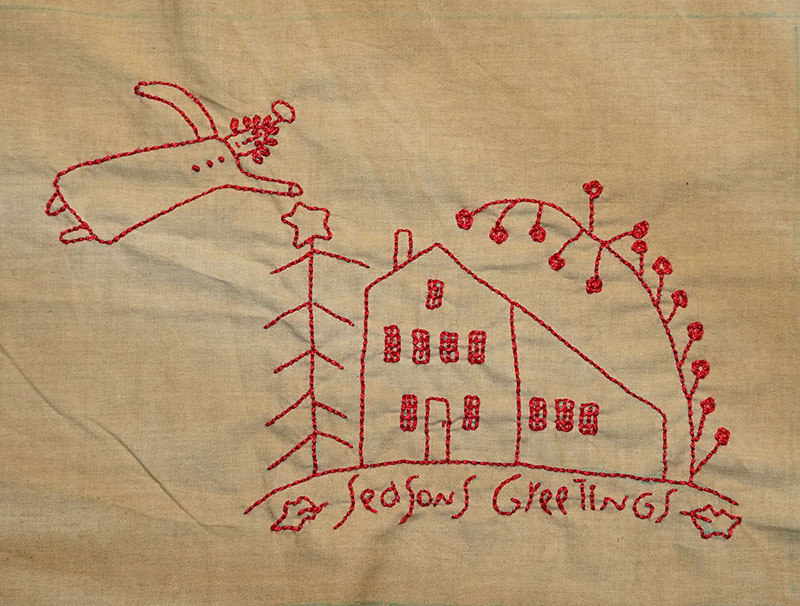 I did finish the stockings, so I will get photos and show those on friday. 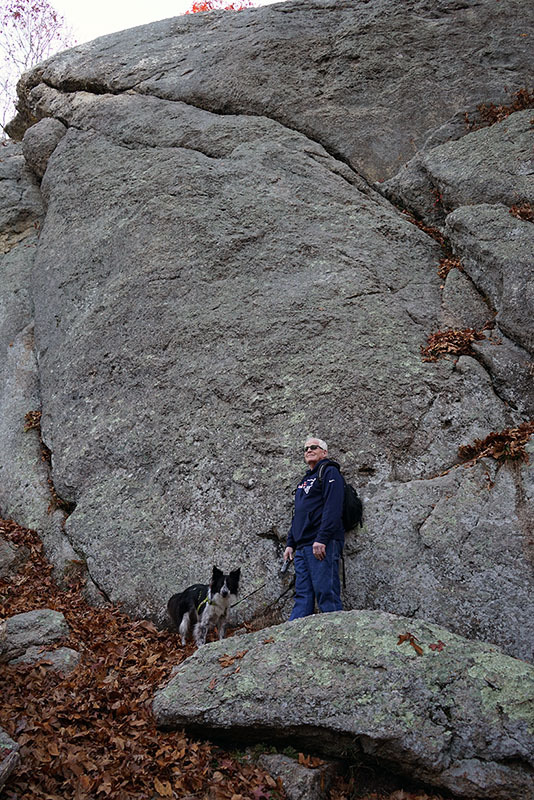 This weekend we did a little shopping and on the way home I wanted to stop at one of our favorite spots, Pettaquamscutt Rock. 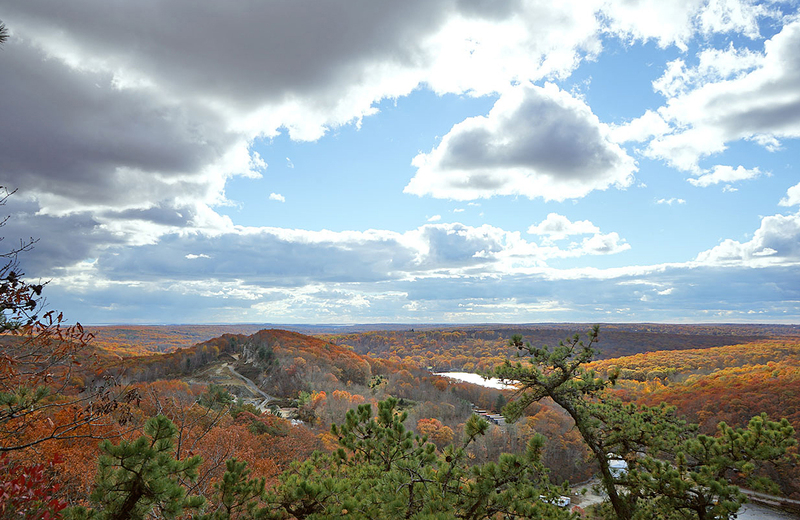 It is a small park with a trail leading to the rocks, so not a big climb but spectacular views from the top. Bill and Bean enjoying a view from the top, it goes all the way out to the ocean. There was a storm out to sea so you could see the thick clouds rolling across the sea. Looking to the left, you can see the Jamestown Bridge. 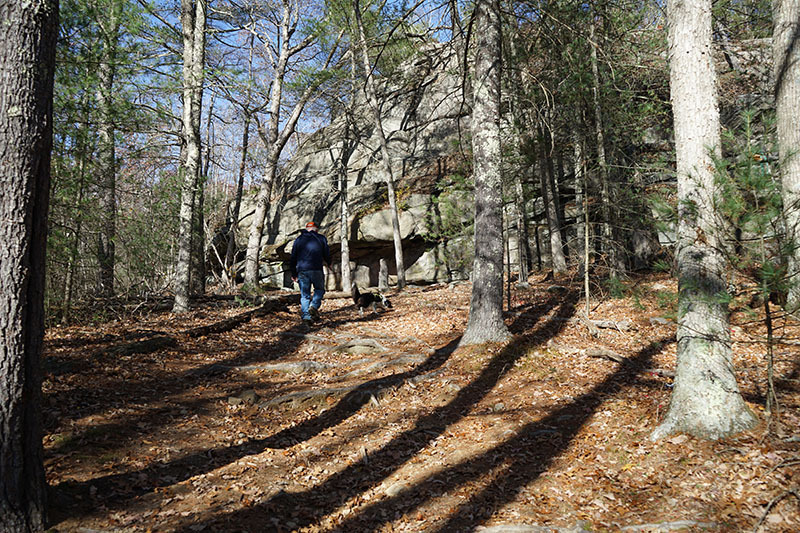 Since it was a short walk, we walked along the bottom area for a bit, you can see how tall the rock is, and on the right it is higher and a popular spot for beginner rock climbers. As we headed home we enjoyed the colors of pre-twilight, it warms up everything and made a beautiful scene at the farm. 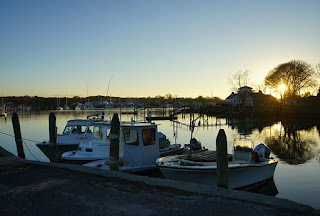 We stopped at our local seafood store to get scallops for dinner and while Bill was getting scallops, I was able to get a few shots of the local harbor. 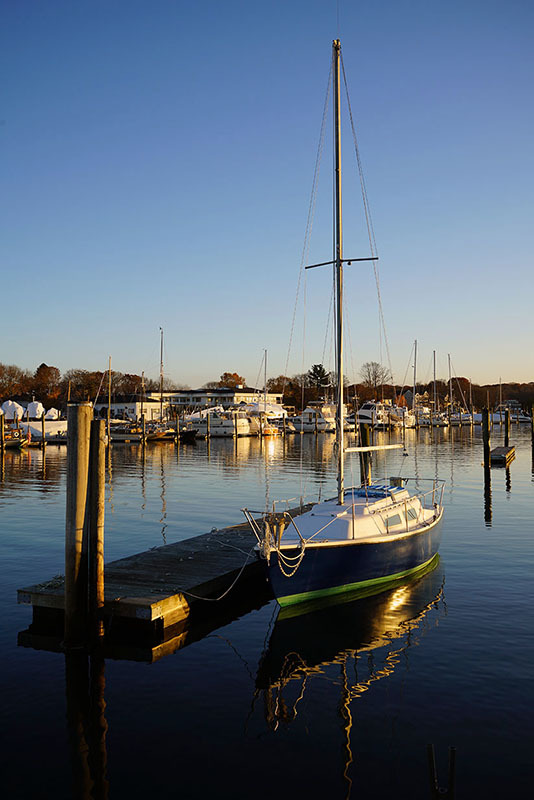 Still a few sailboats docked in the harbor, won't be long before they come out. 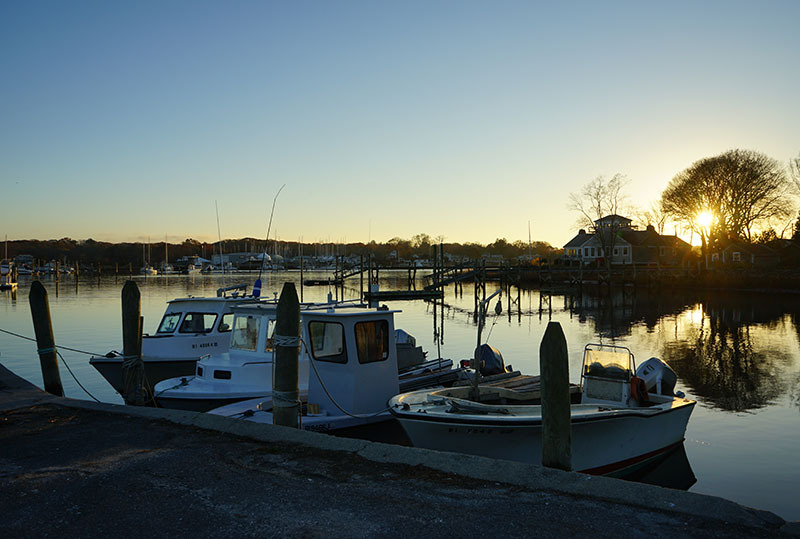 The fishing boats are always docked at this pier, a popular spot to drop off the catches of the day. 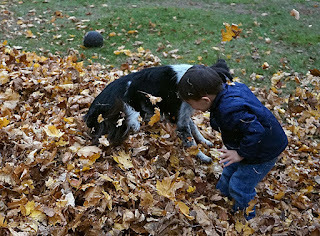 The rest of the week has been rest and letting Bean play outside, he loves leaves and rather play in those, than play ball. 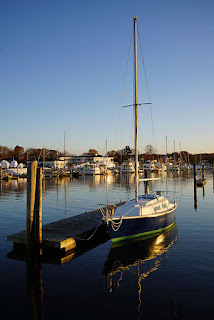 I hope you enjoyed seeing a bit of my local area and I hope that all of you have a wonderful Thanksgiving. 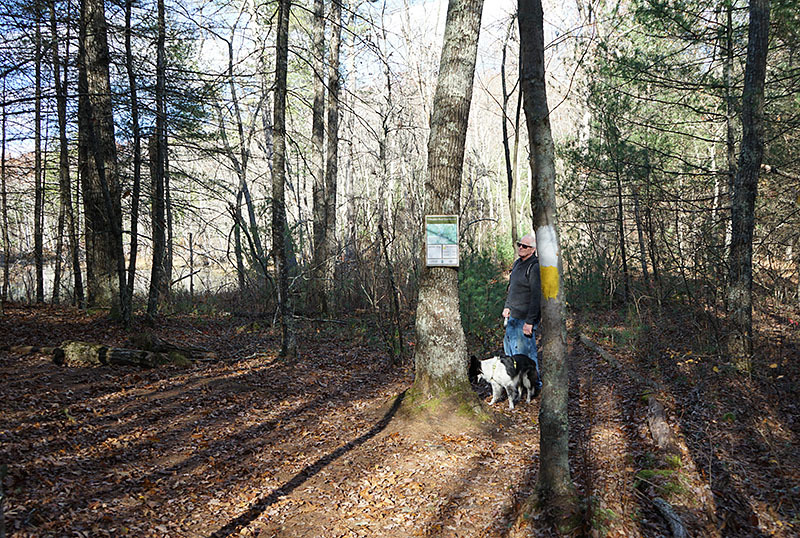 On our last day of hiking, we went back to the Tillinghast management area, but parked further up to try the Wickaboxet trail. 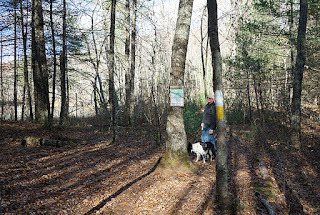 This trail was longer and had several points of interest, that I wanted to see. We started on the main trail and headed to Rattlesnake ledge. The foliage is winding down in some areas and still at peak in others, so I never miss a chance to get about it all, to enjoy the views. 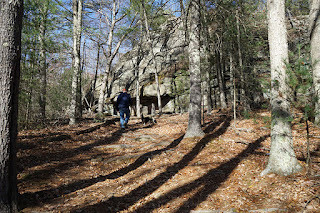 The hike up to the ledges wasn't too bad and it comes around the backside, so much easier than climbing up rocks. The views were beautiful, but a lot of trees blocks the view with a camera, so it was hard to get a shot of the foliage areas to the sides, but still beautiful. 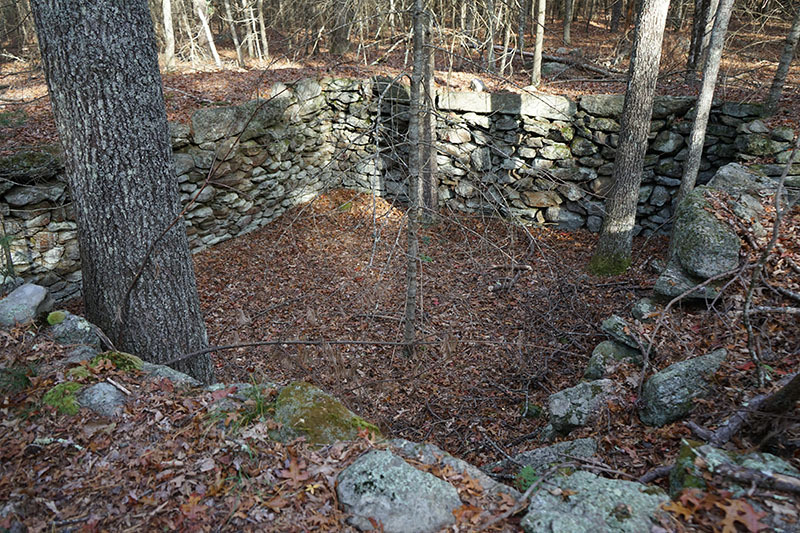 The area was once a thriving village, and you will find several old cellar holes in the area. It is fun to imagine what it was like, when families lived here. 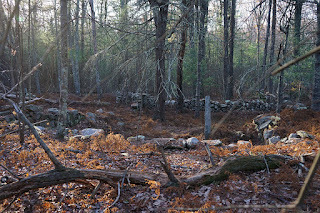 We walked through a beautiful wooded area, no one around, just trees and stone walls. 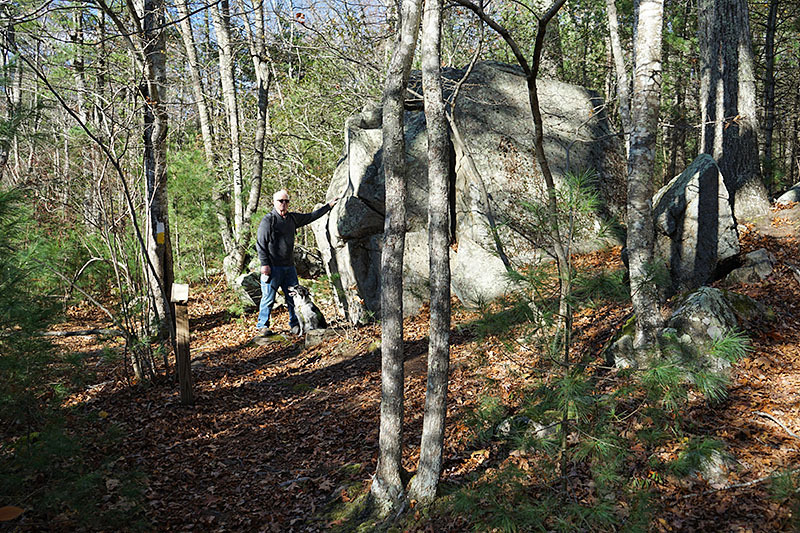 When we came out to the main path, we stumbled onto these odd structures. 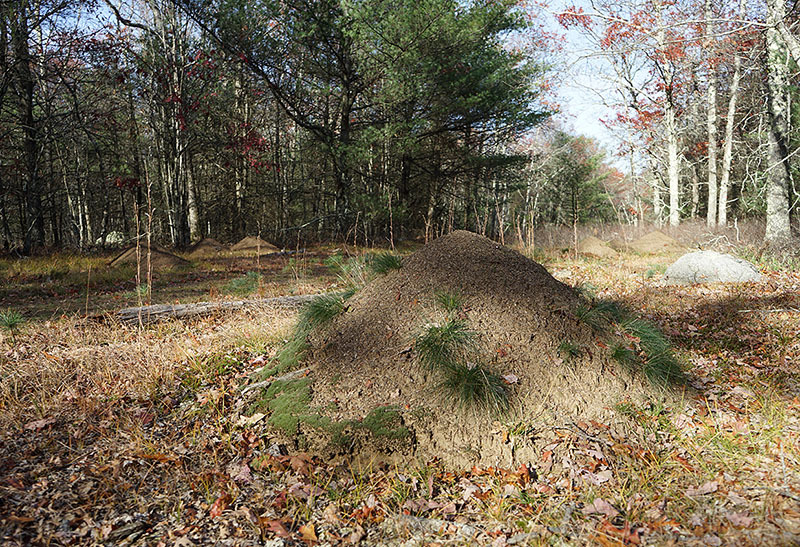 Believe it or not, they are said to be anthills, Bill thinks they are termites, but whatever they are, they are gone for the winter. 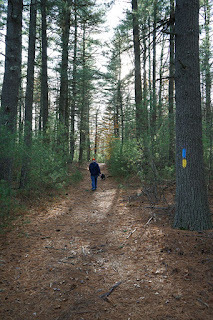 The trail continued on through tall pines, and a soft bed of needles, a nice reprieve from walking on rocks and stumps. We came out to another pond, I can imagine how beautiful this area was when families lived here and spent summers fishing and swimming in the ponds. When we came to a fork in the path, I had to check out what was up ahead, on another path and we weren't disappointed. 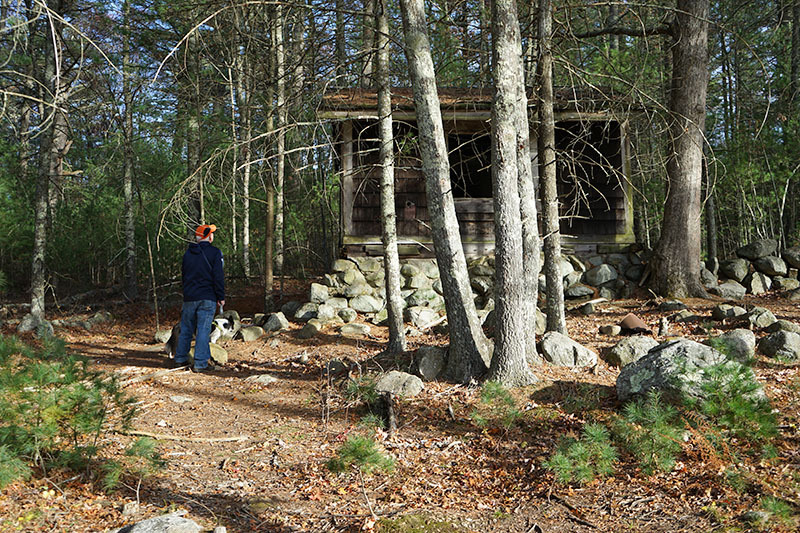 We stumbled onto this cabin, above a small pond and stream. 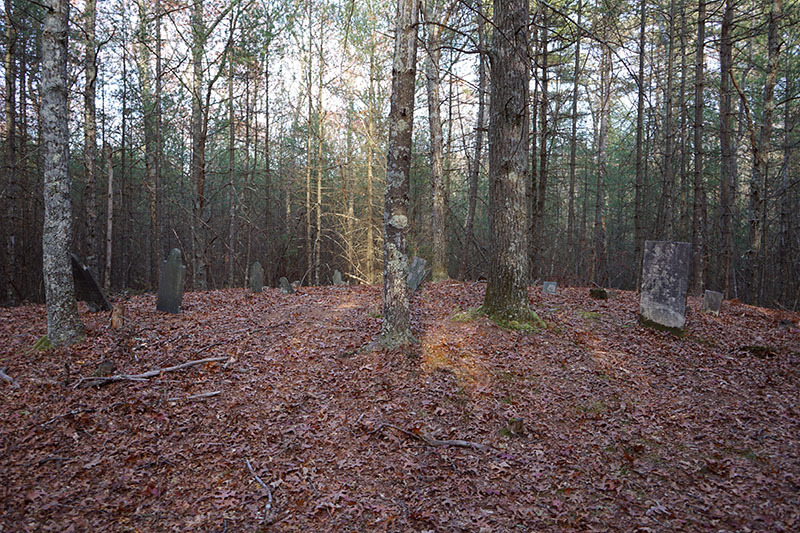 And a little ways up, in the opposite direction, we found the old graveyard. 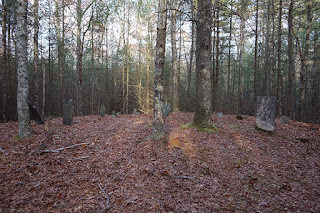 Coming back to our path, we headed back and found another smaller graveyard. The sun or an unearthly visitor? A little further up, we found another homestead, this was an old barn. 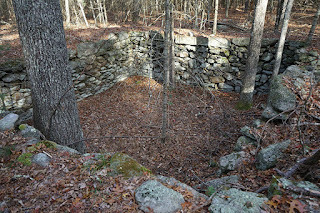 We found the steps to the homestead and another hole that had caved in. 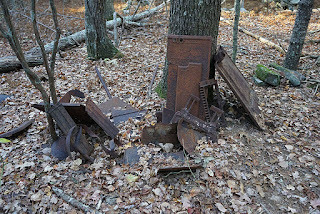 We also saw old bottle pieces and metal that someone had unearthed and left there. The biggest find was this old stove, just sitting there, a reminder of a time gone by. 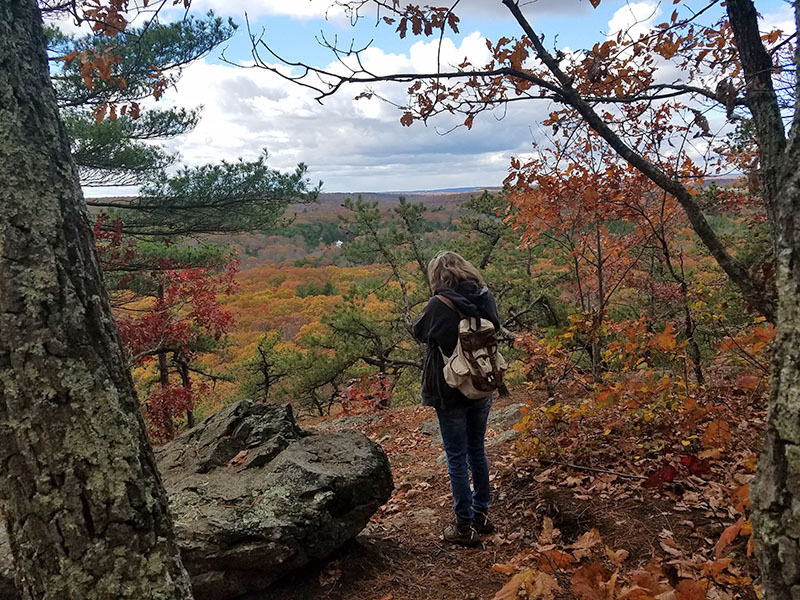 I hope you enjoyed going along on our hike and remember, sometimes the best hikes are in your own backyard, so go out and explore and have your own adventure. 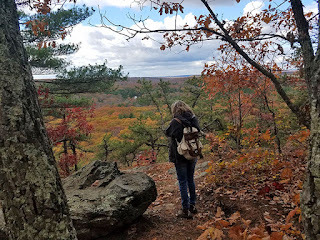 Today is National Take a Hike Day and I was inspired by Cotopaxi, to join in by sharing one of my recent hikes. Cotopaxi is a company that creates innovative outdoor products and experiences that fund sustainable poverty relief, move people to do good, and inspire adventure. One of their products that helps to provide the most funding for poverty relief is their Adventure Backpacks. 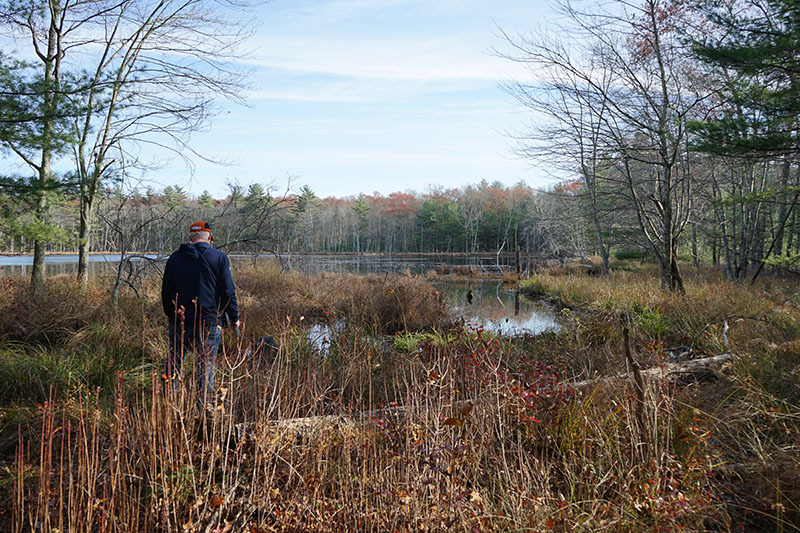 This weekend we spent two days exploring Tillinghast Pond Management Area. The area is also open to hunting in certain sections, so be sure to read the guidelines for proper clothing in hunting areas. It is a wonderful place for hikers of all abilities and with four different trail systems, you can go for a shorter hike around the pond, or explore all of the trails for a 10 mile day hike. It is not only a wonderful place for hikers, but for those who love historical sites. 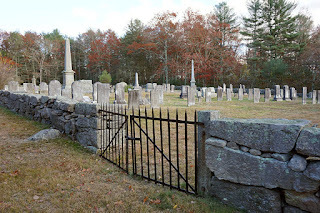 The road to the main parking area can be found by taking a right at the West Greenwich Church, founded in 1750. 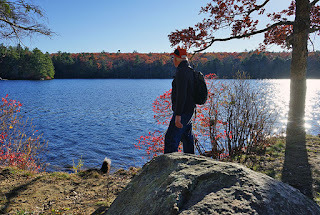 Our first day was on the shorter trail around the pond. There is ample parking and a bathroom at the main parking area, which also gives access to all of the trails in the area. 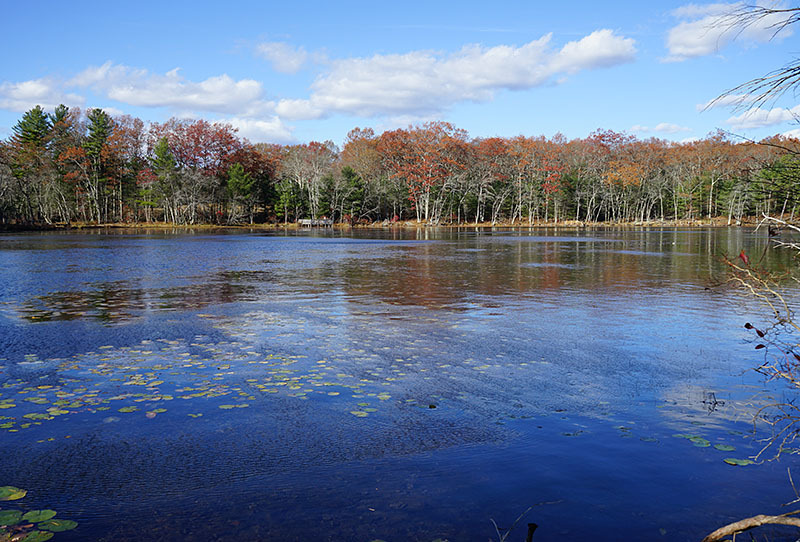 The view from the lot affords views of the pond and a boat launch for those of you who love to paddle. 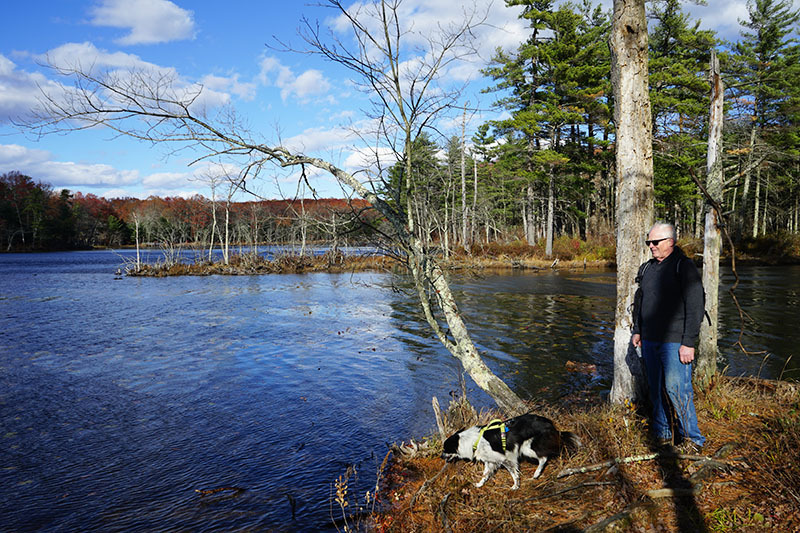 The pond offered several viewpoints and it is also great for the pups, who love to play in the water. 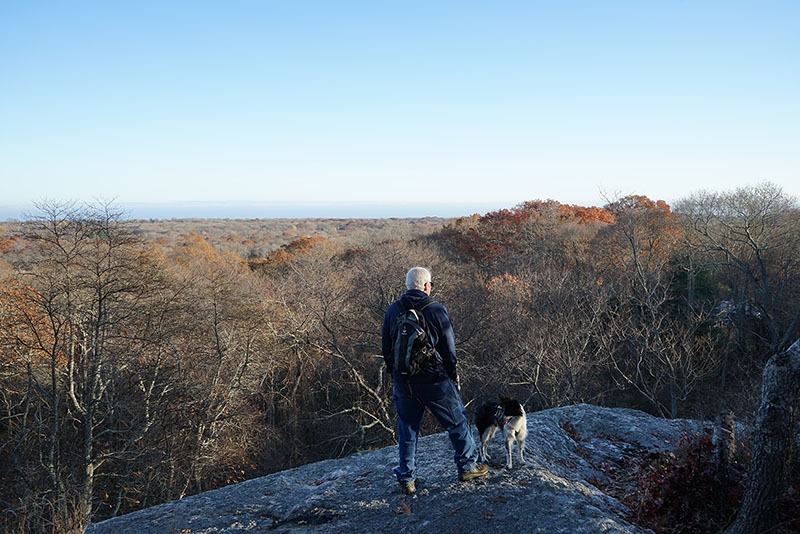 Another bonus to hiking at Tillinghast, the trails are dog friendly. 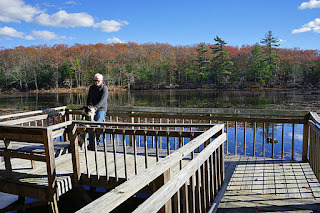 The deck offers views and a place to fish. This area is well stocked, as well. 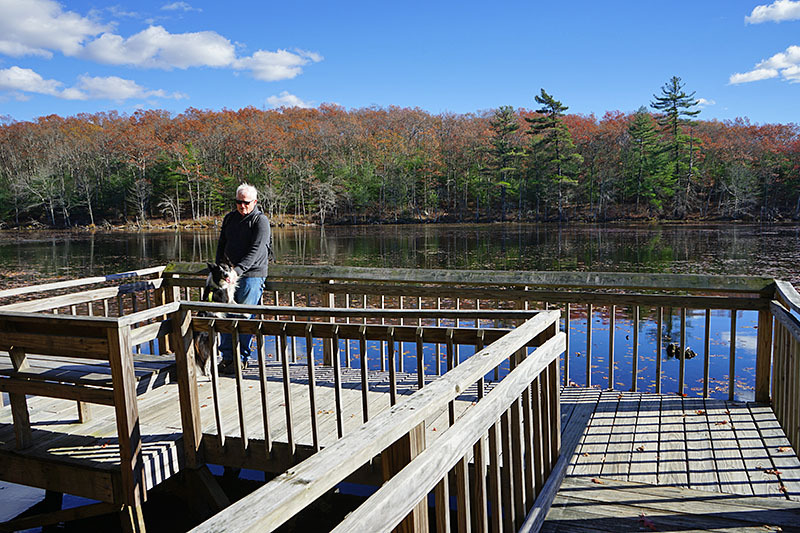 Looking back at the deck, fall is a wonderful time to enjoy a hike at the pond, color abounds. 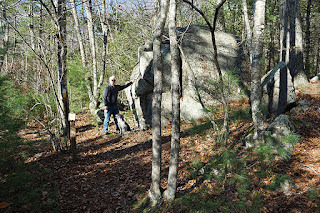 One of the largest glacial rocks in the area. The conservancy has done a wonderful job on the trail system, the paths are clearly marked and maps at the junctions. 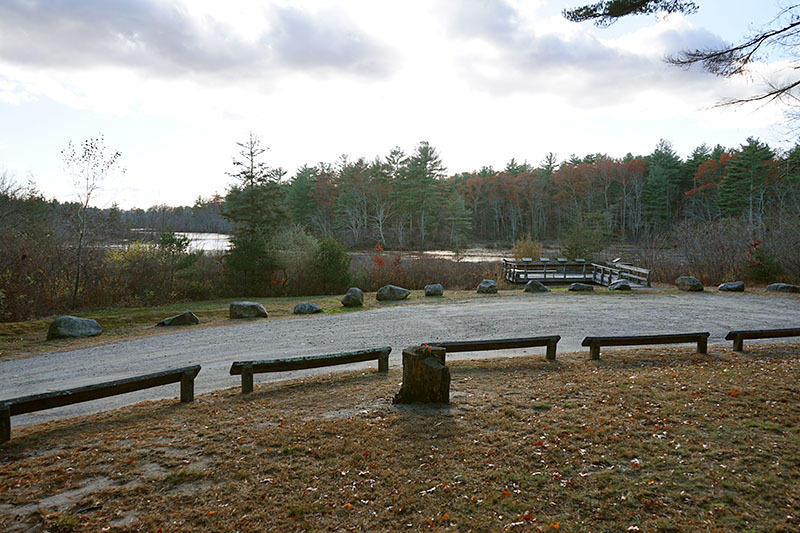 An area with a grassy section and table for those who want to enjoy a family picnic at the pond. The views are stunning at every area. 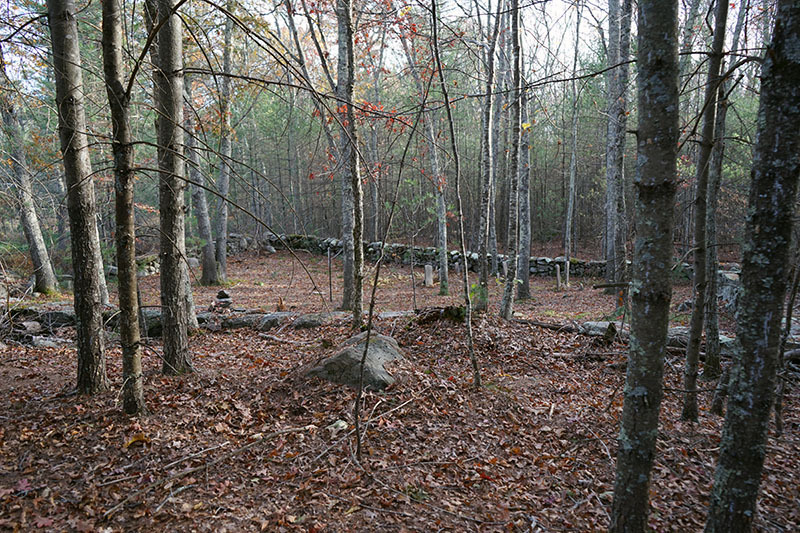 The path ends along a stone wall, which are scattered around the area, as well as fields, which are leased to the local farmers. 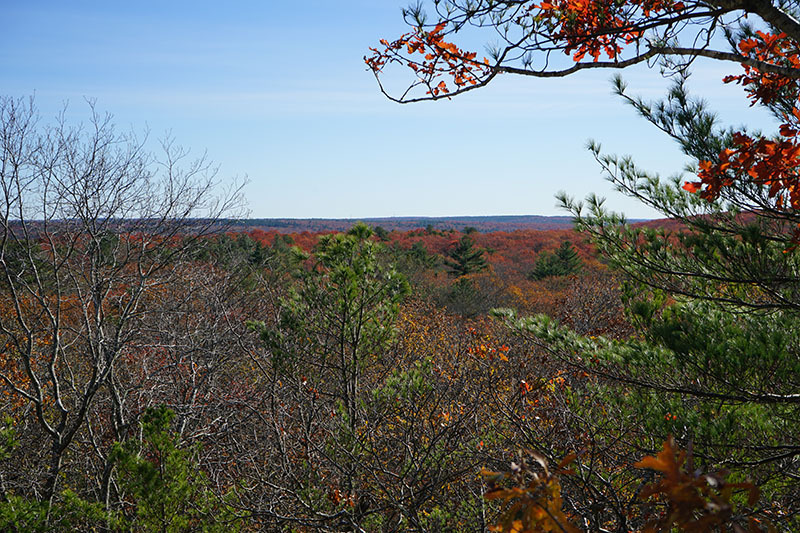 The conservancy has offered a beautiful place to hike, along with sustainable conservation of the land. 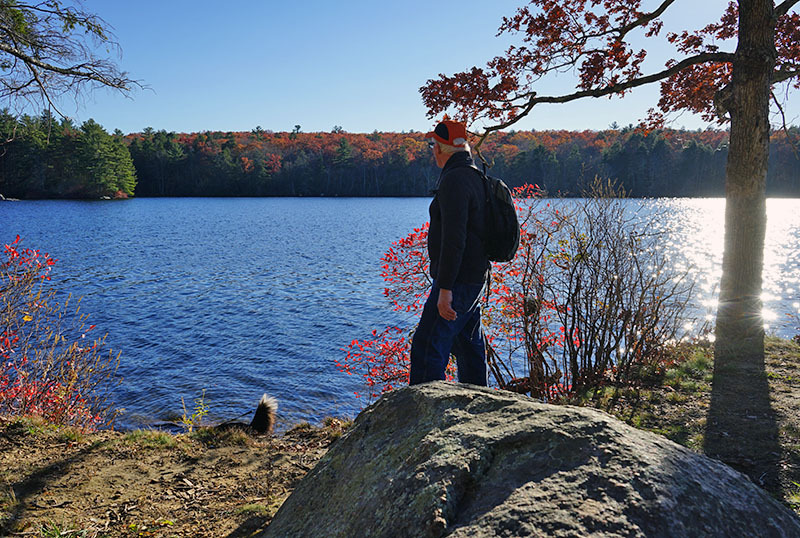 So, what does Take a Hike Day mean to you? 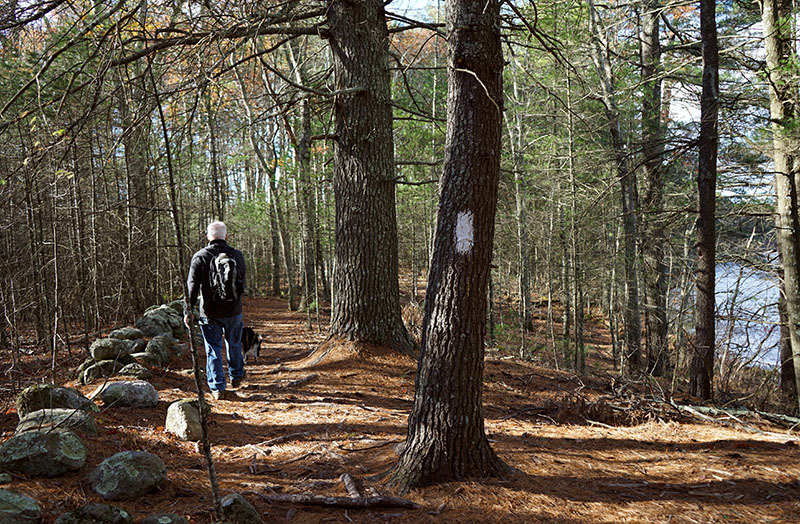 Even if you do not have a major hiking area you can spend the day or even an hour, exploring trails in your area. 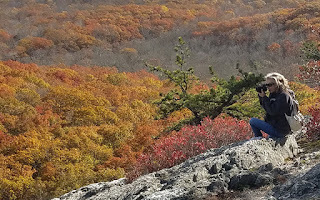 Hiking lowers your blood pressure and your stress levels, a great way to stay healthy and enjoy the beauty of nature. Since we saw so many beautiful sites along both trails, I will be doing part two tomorrow. I hope you enjoyed hiking with us and I would love to hear about your favorite hikes. We had quite the weekend with Bill having three days off. Two days we went to the same place and did two different trails. I will be posting about those hikes on Thursday as part of National take a hike day. Sunday I knew I should rest, but I am a glutton for punishment and we went to Mount Misery. It is over the border in Connecticut, so a nice little drive and as we found out, a beautiful place to hike. 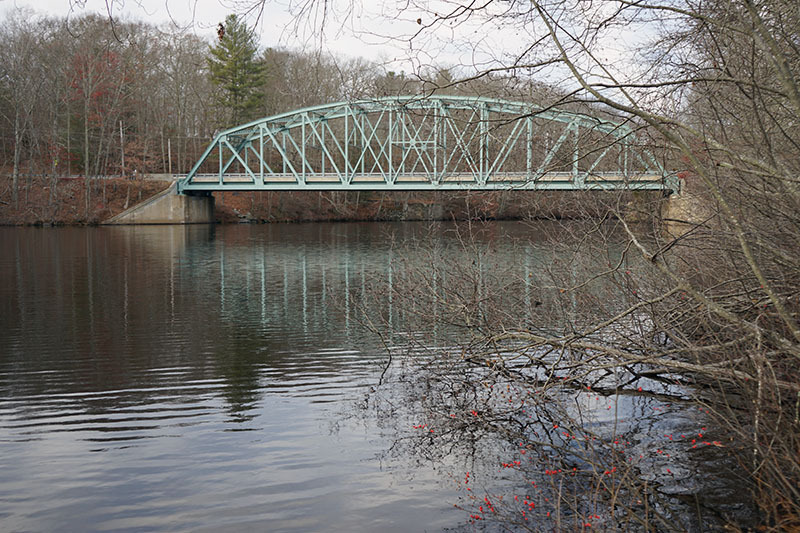 A lot of the names in Connecticut have strange names, another place close by is called Hell Hollow. Why these names? 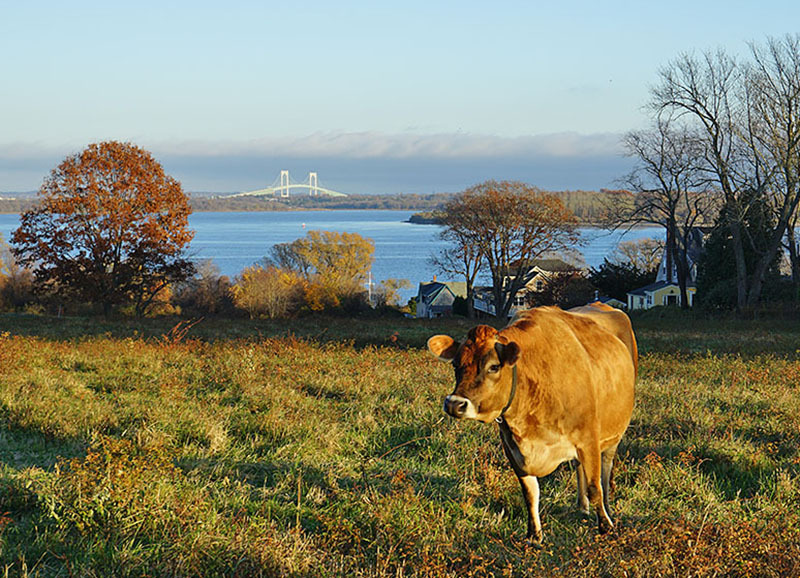 Because the farmers found out that the land was no good for farming and left the land for more fertile areas. They were very superstitious in those days, so a lot of ill fortune was blamed on the devil. 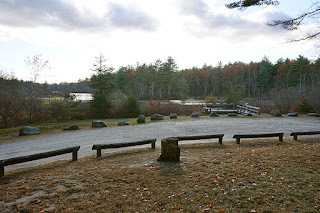 The park has a wonderful picnic area with lots of parking. The trail starts on an old dirt road and then into the woods and up hills, then a ridge and then a steeper climb, so I got another good workout. It was well worth it for the views from the top. It was hard to take photos to show how beautiful it was since the trees blocked the views and we could see them, but interferes with camera shots. The nice thing was, I took a different trail down, less steep and it led to another dirt road so easier hiking and plenty of room for Bean to run back and forth. One thing we found out was, there is a campground there. 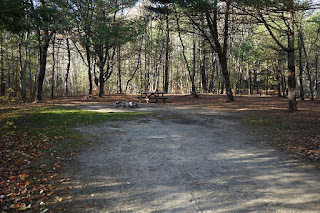 Most campgrounds in Connecticut do not allow dogs but the national park does. 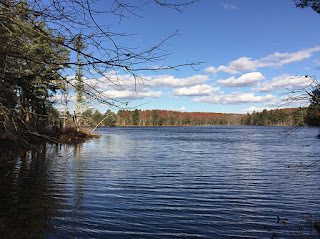 There are only 22 sites but they are large and mostly private, we will definitely have to camp here and there is a private camp right down the road, so we can camp there and ride our bikes in the park. This site is big enough for a family gathering. On the way home we stopped at the pond that crosses into both states. There is a short hike and climb and I was hoping to get a view of the foliage from the cliff. Unfortunately it wasn't high enough, but still a nice hike and views. 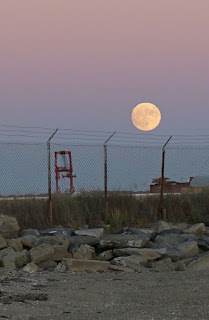 We got home and Bill ran out to get dinner supplies and then we headed to the dog beach to get views of the moon. I picked the wrong place, the moon rose over the ferry, but it was still amazing to watch it come up. I did find that it was a nice place to watch the sunset, so as the sun went down, the moon was coming up. And to top off the day, we had the kids over for dinner. Of course Nick was full of energy and Alex finally warmed up to me and started smiling. It was nice being able to hold him without getting screamed at. A wonderful day but very tiring so today was spent sitting in my chair. 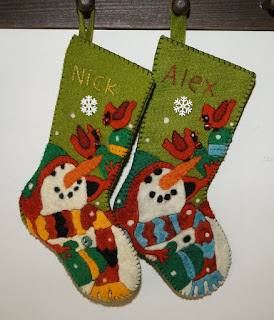 I did get another needle felt stocking kit and plan on giving them to the kids. This week I was scanning in slides that my sister had given me. 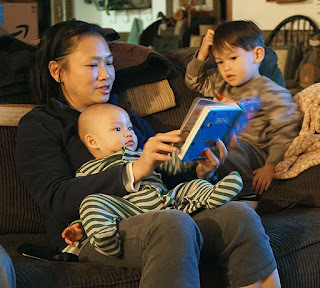 It is fun to see the old photos but sad that most are blurry or washed out. I found one of an old car and my brother gave me the story behind it and his memories. So, I thought, why not do a pillow of the car and send it to him and the others for Christmas. Well, the idea was good but the execution did not work out as planned, so back to the drawing board. I wanted to fit it on a pillow so I changed the size to make it taller and not as long, but that changed the look of the car, it is supposed to be a station wagon, now it looks like a clown car. I also think the windows need to be indented instead of standing out, and the colors get lost on the tan velvet. Here is what I ended up with, I will fix it up, I think some thin black or silver piping under the window areas might be a good fix and I can always outline if needed. 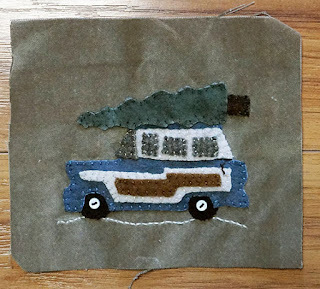 So, now the plan has changed, I will do it in a punch needle piece and add to it to make it nicer. 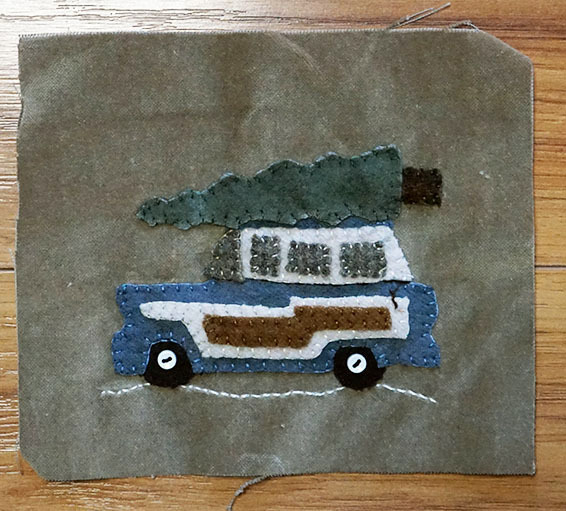 I think it will be a fun Christmas pattern and I know a lot of you have memories of the old woodie style station wagons from your childhood. 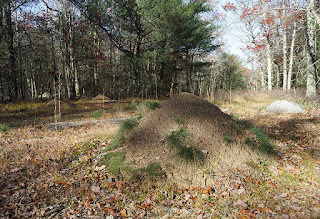 Bill had the day off today, and I have the flu, but I had big plans to go on a new hike today. We went to a pond sanctuary and did the smaller hike which was wonderful, and when I got a little tired, we rested a bit. I will delay showing photos since I have been asked to participate in a national hike day posting, so once I get more details, I will write it up for next week. We did take some new back roads and found a wonderful old cemetery. 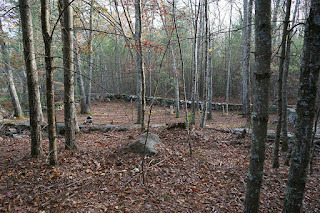 I got some photos of some of the stones and ideas for new patterns, as well as the meeting house on the hill. Here is a peak at the cemetery we visited. I also found another but I was getting tired, so I can go back another day. It was a larger one and it looked like it had some wonderful old stones. 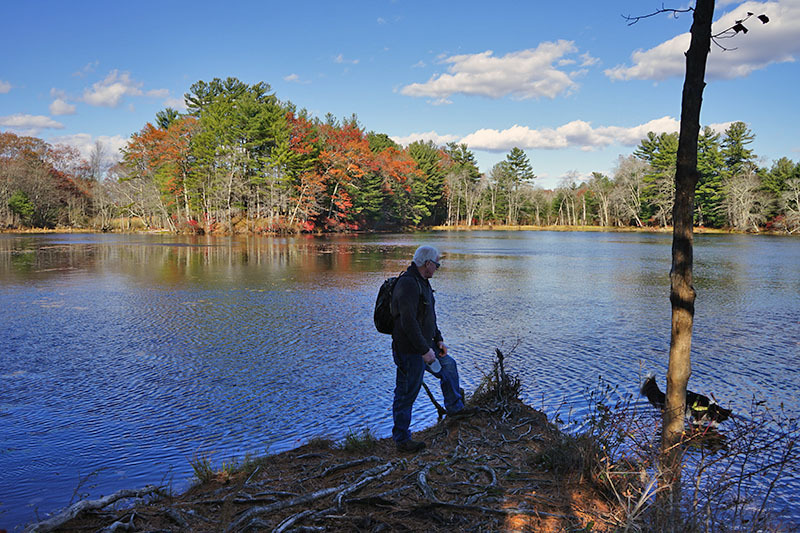 I had hopes for some more small hikes, but the drive was enough and I wanted to stop at a pond I had seen last time. It was smaller and the drought had dried it up, but still a beautiful place. The fun thing was, I noticed a side road and we drove down and found a campground and hiking area. 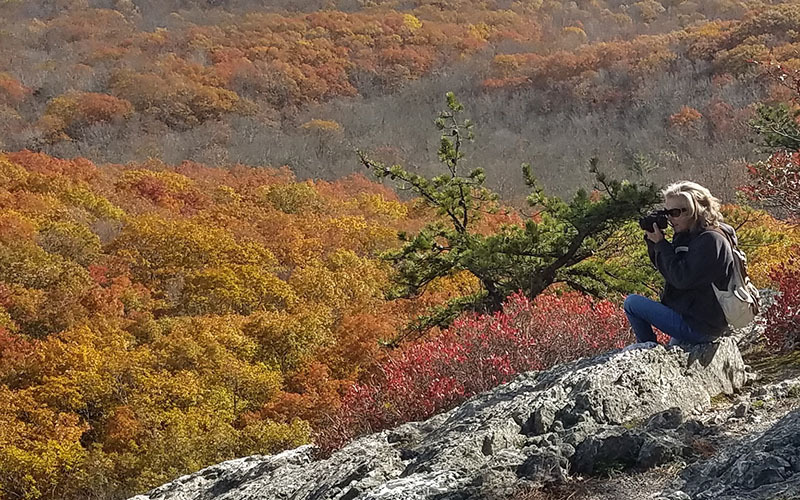 I will definitely be coming back, the hike is another climb, but a short one to some cliffs, and there is still some color to enjoy, so hopefully we can get back this weekend. 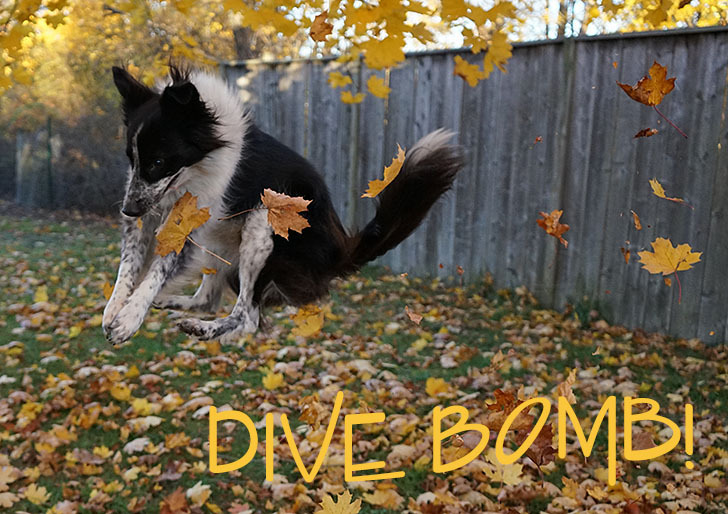 I hope you all have a wonderful weekend filled with adventure and joy. 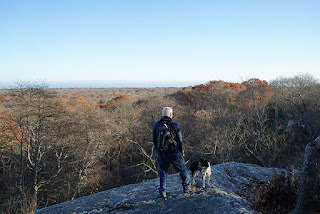 On Sunday we went to Connecticut again and this time we went to Lantern Hill for a hike up to the cliffs. It was almost straight up, most of the way, but a shorter hike, so well worth the climb. On the way, we took a new route, back roads are fun to explore and it was a beautiful drive along the way. 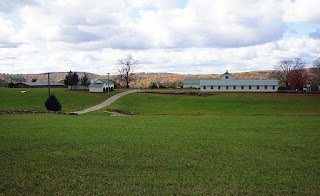 This farm had a backdrop of foliage. 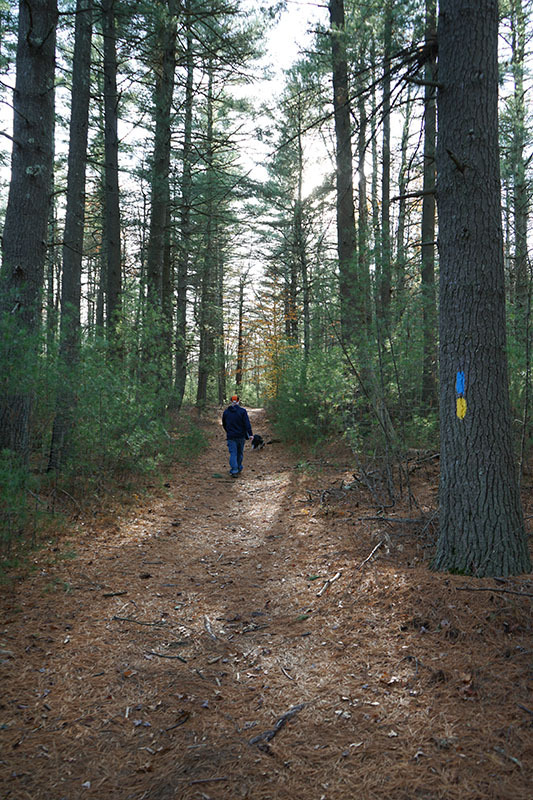 The trail we hiked is on the grounds of the Pequot reservation but the trail is open to the public. 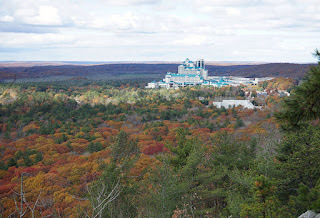 On the first vista we had views of Foxwoods, it has a casino and hotel, as well as a shopping outlet. You can see how high we are, compared to the hotel, and a spectacular view of the area and foliage. 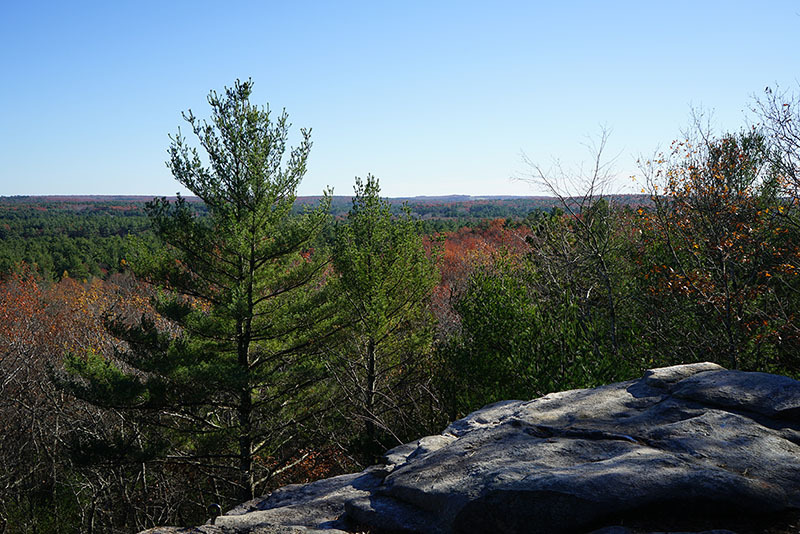 There are vistas, all along the trail to the top. Here I am getting a shot, while Bill takes one of me. 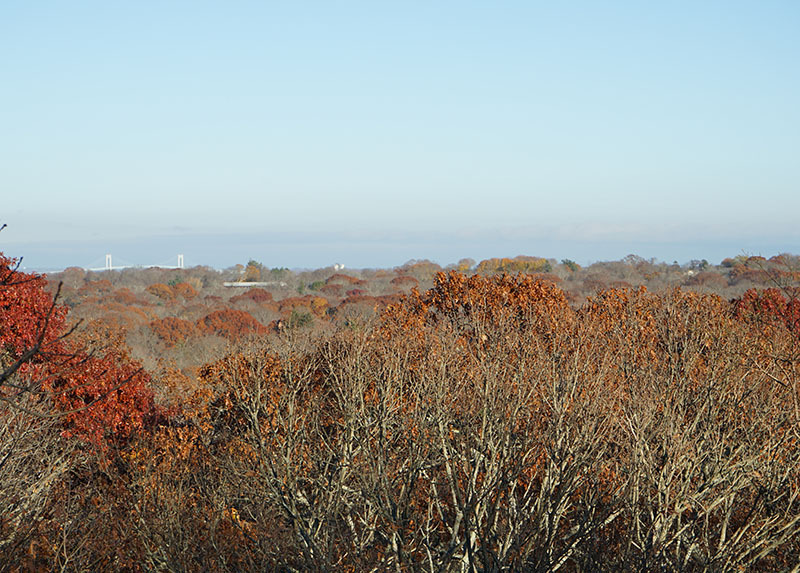 At the top the views are spectacular, you can see the old quarry, the ponds and all the way to the atlantic ocean. On the other side, are views of unending trees, the landscape is a mix of full foliage and old growth, so no foliage on those trees. Bill was taking photos of me again. It was quite the climb for my legs and going down seemed harder since the paths were covered with leaves. We also got a few rain bursts, but it was all worth it for these views. On the way back we stopped at a park called the Ledyard Up-Down Sawmill. 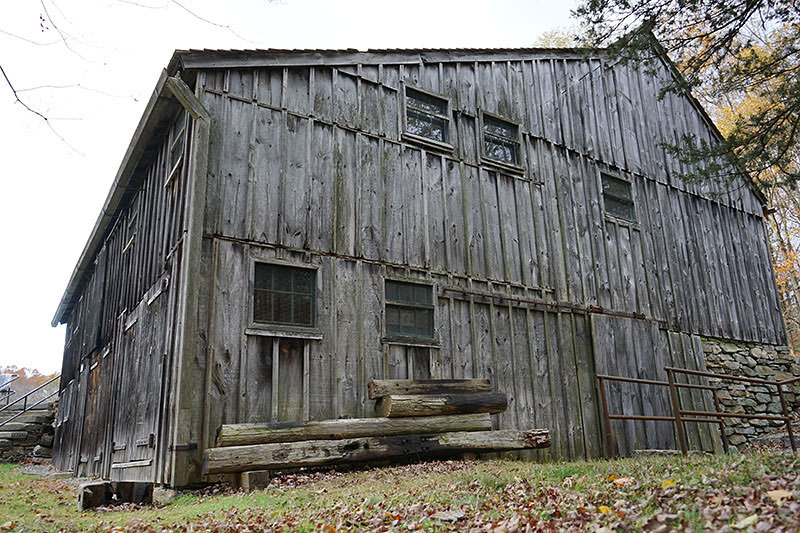 There were a group of church goers on a picnic so it was hard to get shots without a lot of people, but this is the building for the sawmill and I found out that they do tours where you can watch them cut wood using water power. If you click on the link, you can read about it. This is a fun place to come back to when they are operating the mills. And if I didn't do enough over the weekend, we hiked 3 miles around the pond on Monday and yesterday we hiked along another old mill site. It is just too nice out, not to enjoy walking while we can, but i think my body has had enough, it let me know today, so resting up until this weekend. 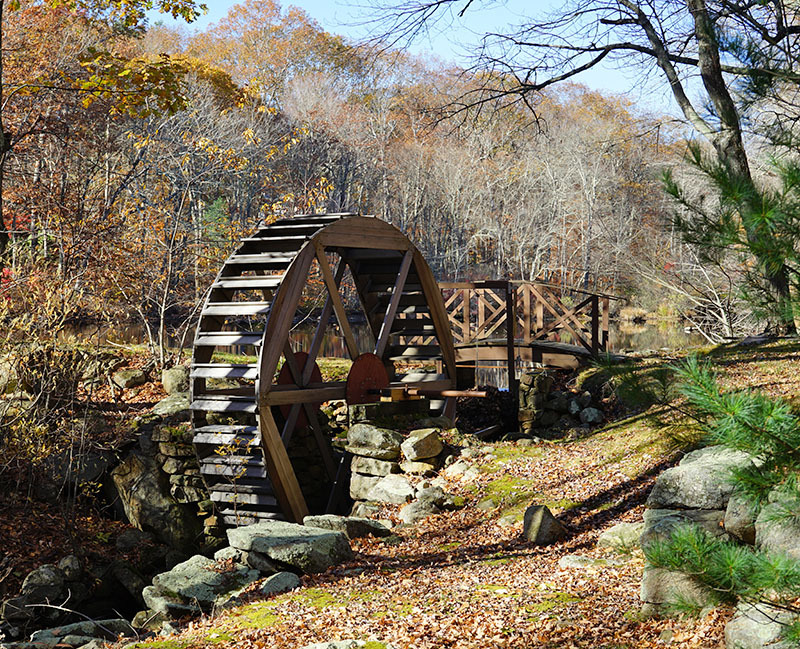 This is a waterwheel alongside a home at the end of the trail.